Our range of products include poldi hardness tester and poldi magnifier. The hammer type Poldi Hardness Tester is suitable for measuring the Brinell Hardness of Steel, Cast iron, Brass, Aluminium, Copper etc. 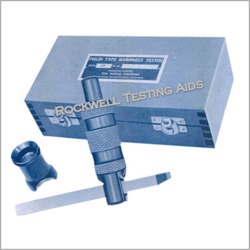 This Poldi Hardness Tester is useful to test parts where bench type model is not useful. This type of machine is most ideal and simple for foundries, Workshopes, Engineering Colleges, Technical Institutions etc. with a spring loaded plunger. We offer to our esteemed cusotmer Poldi Magnifier in Metal Body. It's Magnification is 10Xm measuring range 10mm, scale graduation 0.1 mm, accurancy of measurement 0.05 mm.